The 18-year-old winger arrived at Bayern during this month’s transfer window in an €11.5m deal from MLS side Vancouver Whitecaps FC. And Davies started for Bayern over the weekend and helped the team claim a 4-2 penalty shootout win over Borussia Moenchengladbach to win the Telekom Cup final. “I think he gives us a lot of speed going forward and that he’s good in one-on-one situations,” said captain Manuel Neuer, according to Sport. Austrian full-back David Alaba called the Canadian youngster a “super kid with a lot of quality and potential” after some nice early touches in the final. But, for Joshua Kimmich, Davies’ pace is his most eye-catching asset for Bayern. “He has brutal speed and is extremely dynamic. That can help us,” added the defender. 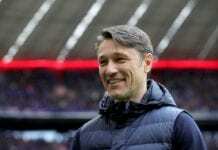 Niko Kovac’s side will now wrap up their winter preparations ahead of Friday’s game at Hoffenheim in the Bundesliga.